Hello, friends! What a week it’s been. I don’t know about you, but it’s going to be a major self-care weekend for me. Books, candles, baths, wine, even some closet cleaning, maybe a little golf… There’s been a LOT happening here (see the awesome news below) and I need a bit of a breather. And of course, it’s time to turn my energies to my 2019 book. I’m in the VERY early stages, not even 100% what the story is, though I do have a theme that I’m very excited about, and a setting, and a main character. But not a title, not yet. That will come soon; I’m one of those thematic writers who really needs a title to make the story come to life. But it’s a story that’s been nibbling on my psyche for five months, so it’s time to open the mental floodgates and let it in. My first step for writing a new book is to clean my office of any and all detritus from the previous title. It may seem trite, but a clean slate is absolutely necessary for me. I’ve decided to go a step further than the new chair and redo everything, including a new desk, and floor to ceiling bookshelves. It’s time to move on from my intimate cubbyhole and design something that’s going to serve me better — AKA, more book space. It’s this pesky little problem that comes with writing a lot of books — they have a tendency to pile up! With that, I’ll leave you. Time for the latest and greatest links! What she reads if she loves V.E. Schwab. I'm so excited to read VENGEFUL! Victoria is a marvel; her books just keep getting better and better. 14 Signs It's Time To Walk Away From That Book You Just Can't Seem To Finish. I hate to DNF a book, but sometimes it’s just not working for me. I have finally given up the guilt and say it’s not you, it’s me. Unless it is you. But that’s rare…. 7 Easy Ways To Make Sure You Actually Get Writing Done On Your Next Trip. Good advice - especially setting specific time blocks. It’s hard to meet word counts on the road, but you can always find thirty minutes to touch the story. 25 of the New Words Merriam-Webster Is Adding to the Dictionary in 2018. I’m down for adorbs, marg, and guac. What are your new favorite additions? French bookshops revolt after prize selects novel self-published on Amazon. “According to the French author Laurent Binet, it’s easy to understand why bookshops are up in arms. For booksellers, the issue was not so much that the book was self-published, he said, but that it was published through Amazon.” As an author who has a few indie titles, I have very mixed emotions on this. I understand the bookseller position, I really do, but I hate to see good work stifled, too. 23 Book Jokes You’re Gonna Laugh At Even If You Haven’t Read In A While. These are great! Speaking of indie titles… In case you missed my announcement Monday, I have a new book coming out! My show A WORD ON WORDS was on national TV this week, thanks to The Great American Read! What Makes a Great Book included excerpts from our interviews with authors John Boyne, Elizabeth Gilbert, and Mohsin Hamid, as well as with poet Billy Collins. Authors and Their Hometowns included an excerpt from our interview with John Boyne. So cool! 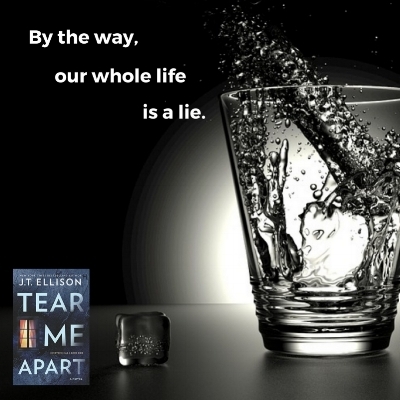 Phenom skier, a terrible accident, murder, motherhood, mental illness, and so much more in this chilling tale of domestic suspense~JT Ellison on TEAR ME APART. I really enjoyed talking with Leslie Lindsay in this exclusive interview. I think you’ll like it, too! That's all for now! Take care of yourself this week. Enjoy the cooler nights, build a fire, kick some leaves, and read a good book. I’ll see you next Sunday!